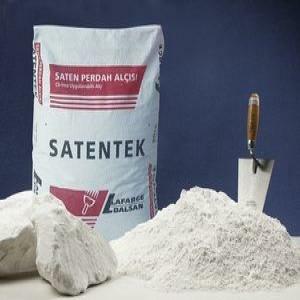 DERZTEK is a joint compound which is used at ALLEV plasterboard joint tapes. Special additives in its structure, retard the absorption of the DERZTEK mortar water by the plasterboard surface. Besides its filling function, DERZTEK also forms a smooth surface as a result of its special grain-size distribution. It has a high adherence property. No cracks will occur at the joints as DERZTEK has a good flexibility. Also, the applied surface behave monolithically. Put some water in a clean bowl. Sprinkle DERZTEK until it covers the water surface. Wait for a few minutes, then mix the mortar until a homogeneous mixture is achieved. After mixing, the mortar is ready to use. The mortar in the bowl can be used for approximately 1 hour. For the application, use steel spatula in two phases. Apply abundantly the first layer of DERZTEK, through the width of spatula, on the jointing tape that is firmly pressed just at the centers plasterboard joints. Wait at least 2 hour for the setting of the first layer. Before applying the second layer, scrape off the residues on the surface with spatula. Apply the second layer approximately 20 cm wide, as aligned with ALLEV plasterboard surface. Using DERZTEK within one year after the date of production is recommended. Poor or over-long storage may deteriorate the physical properties of DERZTEK.